Tooth Mountain is generally seen as an entrance or exit summit of the celebrated Cumeengeera Horseshoe. It comprises a huge dome of mostly exposed tilted rock layers. 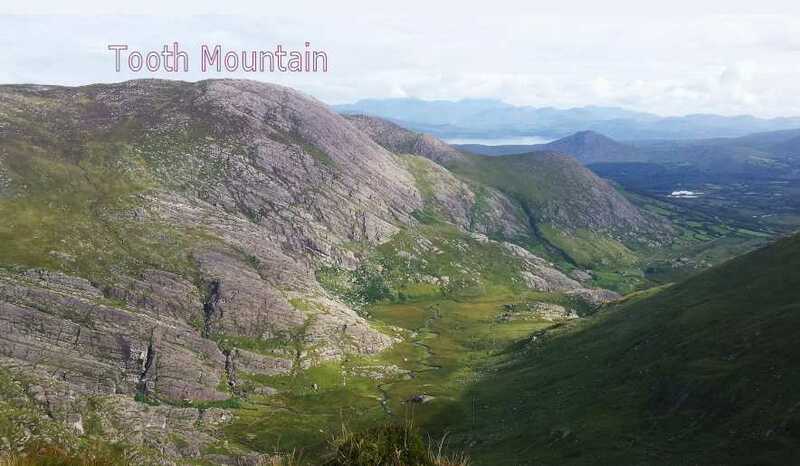 The summit plateau offers a platform for the observation N and NW of Kenmare River and the Iveragh Peninsula beyond - Ardgroom Harbour, the faraway Skelligs, the extraordinary Pocket enclosed by the horseshoe, Lackabane and the Eskatarriffs in particular. Cumeengeera is generally reached from Kenmare by driving through village of Lauragh. A gradual ascent from V76724 57296 A is recommended.This route leads naturally to a little cliff top walk curving to the summit (taking in the twin spot heights 513). An alternative approach (involving a charge imposed by landowners of €4 for access to include parking) involves parking at V75426 55335 B, and then going through a gate into the field to the right of the nearby bungalow, reaching the summit plateau by following the river gully that heads N before contouring W.
The journey to sister summit Coomacloghane is short and sweet.